Online Exhibition: Stethoscopes & Petticoats examined the amazing contributions that non-conformist women made to the changing social landscape of Britain and beyond. The role of women within the history of the British non-conformist movement has traditionally been subsumed under the history of men. 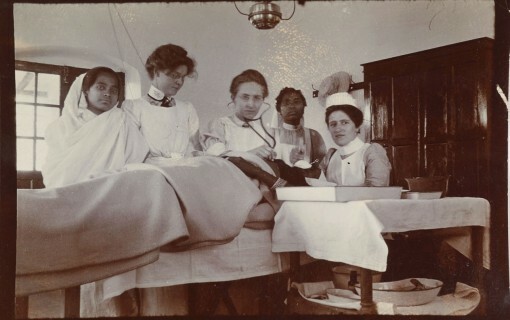 Stethoscopes and Petticoats, presented by The Angus Library and Archive, addresses this imbalance, and highlights the significant contribution of non-conformist women to the changing landscape of social inequality both at home and abroad. A strong desire to live out their religious beliefs connected to freedom and equality stirred these women to action, despite continuous opposition to women’s involvement outside of the expectations of their gender. Non-conformist women achieved success in the male-dominated fields of literature, social and political activism, mission work, and medicine, paving the way for future generations of pioneer women. Photo of Miss E. Lois Chapple, starting on a journey, Sinchow, China, Shansi. Photo taken January 1925, Taiyuanfu (Miss Chapple: third from left). ‘Reasons for Substituting East India, for West India Sugar’ (1826) Elizabeth Heyrick (1769 –1831) Pamphlet from the Commonplace Book on Slavery, a scrapbook of antislavery literature compiled from various sources.